Philip Blumel: Well, what do you know? Mayoral term limits are still alive in Chicago. Hi, I’m Philip Blumel, welcome to No Uncertain Terms. The official podcast of the Term Limits Movement for the week of February 4, 2019. Philip Blumel: We have given up after the Chicago Board of Election Commissioners ruled that mayor term limits would not appear on the November 2018 ballot. Well they did, but the results are sealed, and the election ruled void. 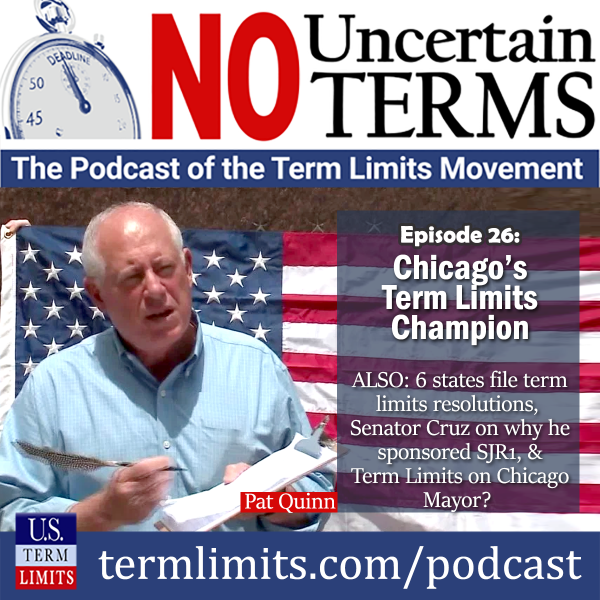 This week’s special guest, former Illinois Governor, Pat Quinn tells us that this is not the end of the story, and that the voters will not be so easily silenced, not if he has anything to say about it. But first, US Term Limits executive director, Nick Tomboulides, with this week’s roundup of term limits news. Hey Nick. Philip Blumel: Every week I’m looking forward to hearing what the latest news is on the term limits convention bills in the states. Where are we at? What’s the big news? Nick Tomboulides: Well, we are seeing unprecedented energy for term limits all over the country. This issue is without question, on the march. There’s a historically high number of states pushing for term limits on Congress. Seven states have already filed the Term Limits Convention Bill for this session. They are Arizona, Connecticut, Georgia, Maryland, New Hampshire, South Carolina, and West Virginia. There are another seven states that are expected to be filing this legislation soon, so the states are on fire for term limits. I don’t think the politicians are doing it on their own. I think they are hearing from our volunteers, our activists, people all over the country who want this to happen, who are calling, emailing their state legislators. That is really making a difference. Philip Blumel: Yeah. That’s more states than what we expected to file a Term Limits Convention Bill this year, isn’t it? Nick Tomboulides: It is. It is, yeah. There’s almost been kind of like a bandwagon effect where some states see that others in their region are doing it and they want to be part of something. Philip Blumel: All right, well that’s exciting. So who’s leading the pack? Which state? Nick Tomboulides: Without question, that is Arizona. If you recall, Arizona actually passed the Term Limits Convention in their State House last year. We came very, very close to getting it in the state Senate. This year, I think we are going to be successful because we have rolled out with 27 House sponsors and 16 Senate sponsors in Arizona. To put that in context, there are only 60 members of the Arizona House, and we’re starting with 27 supporters. We just need an additional four votes to get it passed in the Arizona House. The Speaker typically doesn’t sponsor anything, so he doesn’t count. It doesn’t mean that 33 people are against us. It means that we are very, very close to getting over the threshold we need to pass the Arizona House. Kelly Townsend, a State Representative out there, is our lead sponsor. She has just done a terrific job signing people up to the cause. It’s bipartisan. Of the 27 House sponsors are Republicans and Democrats leading the charge, so it’s very exciting. Philip Blumel: That is. Okay. Well, that’s what I want to hear. Now with the threshold for state action on this is pretty high though, I got to tell you. Remember back in, was it 1992, 14 states had initiatives on the ballot calling for federal term limits, and it passed in all 14. Nothing’s ever been a success in a initiative and referendum effort that compares to term limits in the early 1990s, so you and I have a pretty high bar to try to exceed. Nick Tomboulides: Yeah. And there’s a reason why people sometimes called term limits the most successful grassroots effort of all time in America. I mean, there’s such a rich tradition of citizens putting their feet to the pavement and getting this on the ballot in hundreds of different municipalities, states at basically at every level of government, people are doing the hard work to make this happen. In Arizona, by the way, I neglected to mention this, there are 16 Senate sponsors on the resolution, and there are only 30 members of the Arizona Senate. Just in terms of sponsors, we already have a majority in the Arizona Senate, that includes the Senate President, Karen Fann. Nick Tomboulides: A lot of this has to do with the efforts of our team on the ground. The Arizona director, Suzette Meyers, has done an incredible job. She actually met with the Speaker of the House last week, a guy named Rusty Bowers, and Bowers said he’s encouraged by this because it is bringing people together and it’s giving Arizonians in both parties, something to unite behind. Speaker 4: Senator Ted Cruz is our guest. You have proposed a constitutional amendment with regard to term limits. Tell us about that and why. Ted Cruz: Term limits is a policy that Texans and Americans overwhelmingly support by big bipartisan majorities. I’ve introduced a constitutional amendment that would limit house members to a maximum of three terms, which would be six years, that would limit the senators to a maximum of two terms, that would be 12 years. And the biggest reason is I don’t think there could be anything more important we could do structurally to drain the swamp then getting rid of the career politicians in both parties, Republicans and Democrats, and getting back really to the vision of the framers of citizen legislators who go and serve some time in Congress, and then return to their states and returned to working for a living. You know, I got to say before I was elected to the Senate, I supported term limits. Having been here and seen it firsthand, I now support them a 1000 times more. And the reason is that if you look in Congress, the dominant instincts in Congress is risk aversion, both in the Senate and House, people want to get reelected and it just swamps everything else. Ted Cruz: And as a result, when you sit down to discuss any issue, people are afraid, they’re timid, they’re scared of their own shadows because to address any important issue, to address any difficult issue, to stand and fight entails risk. It means you may be attacked. It means you may be criticized. It means donors may flee from your campaign. And as a result, elected officials are focused overwhelmingly with getting reelected. I think with term limits, we would instead have people willing to stand up for the principles they believe in because they wouldn’t be just tunnel vision focused on I’ve got to get reelected and stay in Washington. Philip Blumel: The new rankings just came out from the American Legislative Exchange Council in which they look at all the states based on 15 policy variables, and term limits is not one of them. And Arizona was number five, and Arizona is, of course, a state that has term limits on their state legislature, and of course now they’re going to play a pivotal role in helping us get term limits on the US Congress. Nick Tomboulides: And those rankings, by the way, any rankings of states that you’re able to find always show that on average states with term limits on their legislature, have a better than average rating than states without it. Philip Blumel: And that was true in their latest rankings. It’s the usual. Most all the term limit states or are bunched up in the top half of performance, and this one’s no different. I know we reported on the a similar rankings from the Mercatus Center that came out last October, November, which they’re looking at the fiscal health of the states specifically, and similar result, most of them were bunched up at the top, including four of the five states with the best fiscal health, were all states that had term limited legislatures. That’s of course gratifying as part of what tells me that we’re on the right track. Nick Tomboulides: Yeah, and everyone will probably define success a little bit differently in terms of how their state is doing because no two people agree on every policy, but there are just some fundamental areas were states with term limits are doing well. They do a better job paying their bills, both short term and longterm. They have bigger rainy day funds. So in the event of an economic downturn, in the event of a recession, they’ll be able to meet their obligations and keep providing a high level of services to the citizens. A lot of these states make promises to state employees who retire, pension obligations. States like Illinois, unfortunately are hundreds of millions of dollars in debt. They just simply don’t have the revenue or the reserves to meet their pension obligations for longterm employees, but the states with term limits do a better job with that. And so that’s an area where I think Democrats and Republicans agree, a state should be able to pay its bills, and when you have term limits, the legislators behave a lot more responsibly. Philip Blumel: Yep. That’s what we’ve been finding. And unfortunately, Illinois ended up dead last as having the worst fiscal health of any state in the nation, and of course, they do not have term limits. In fact, they have this speaker of their house who’s the longest serving speaker in American history, Mike Madigan. And we have on this podcast today, an interview with the former governor, Pat Quinn. Philip Blumel: Former Illinois and Governor, Pat Quinn was born in Chicago, and has served the state in several offices including the State’s Treasurer. Throughout his private and public careers, he has always advocated government reform, including term limits, and made great use of the Citizens’ Initiative. His latest effort is called Take Charge Chicago, a project which last year successfully placed to measure on the ballot to limit the terms of mayor to eight years in office. Philip Blumel: Hello, Governor Quinn? Governor Quinn: Yeah, right here, Phil. How you doing? Philip Blumel: I’m doing all right. Thanks for spending some time with me today. Over the years you’ve worked on campaigns and supported government reform of many kinds, whether it be initiative and referendum, the right of recall, term limits, et cetera. And I like to point out when talking about you that this wasn’t just populous rhetoric, you’re in the streets leading and running campaigns. Where does the passion for this particular type of reform work come from? Governor Quinn: I started out as an organizer, a grass roots organizer, and I believe in direct democracy where owners get a chance to vote on issues and to make the law and essentially be the fourth branch of government. And so we’ve done a lot of petition drives over the years to basically, as you say, we passed a Recall Amendment in Illinois to cover the Office of Governor. Before that we put a binding referendum on the state ballot to reduce the size of the Illinois House by 130. Used to have 177 members, and it now has 118 and people voted for it, it was called the Cutback Amendment. We also did a petition drives for term limits on … Excuse me. State legislators, that went to the Illinois Supreme Court and after gathering nearly half a million signatures by a four to three margin, the Illinois Supreme Court wouldn’t allow it to be on the ballot. So we were very disappointed in that. But we’ve been very successful at promoting the issue of term limits at the local level for mayors and local officials, and that’s why we got involved in the battle for term limits on the Chicago mayor. Philip Blumel: Right. Let’s talk about that. That’s the most recent history. We followed that on this podcast, and we saw that you were trying to establish eight year term limits on the mayor. What went wrong? Governor Quinn: The matter is still being litigated to this very day. We gathered the appropriate number of signatures, far more than we needed. A minimum here was like 52519, but we gathered 87000 signatures to qualify for the ballad. The opponents, including the mayor of Chicago, were trying to keep it off the ballot, and they had something called the Rule of Three in Illinois, there’s a statute that says that you can only have three referendums on the ballot, it’s a state statute. But it conflicts with the Illinois Constitution, which allows voters at the local level to put proposals on the ballot dealing with their mayor and their local officials in their terms of office. Governor Quinn: We gathered the appropriate number of signatures. The other side try to keep it off the ballot, and the court permitted it to be voted on November sixth of last year. We know it passed by a wide margin, but it’s still being litigated, whether the board of elections in Chicago can count the votes and certify the results, so we’re now headed to the Appellate Court. We’ve done this before. That’s how we won the Cutback Amendment years ago in 1980. That’s where we’re at today. We have sharp elbows and we understand how important it is in Chicago to have term limits on the mayor, and for that matter, term limits on the Alderman as well. Philip Blumel: Great. Well, this is still alive. I’m happy to hear that. And I’m also anxious to hear what the vote was. I know they’re not releasing that information just yet, but they might have to. and hopefully they will. Governor Quinn: They’re suppressing the vote. That’s what the Board of Elections of Chicago is doing. We filed Freedom of Information Act request several times. They won’t release the results until this litigation over our referendum is completed by the Appellate Court or the Supreme Court. But the bottom line is, in Illinois 25 different cities have already enacted term limits on their mayor and their officials, almost always by a grassroots petition. But the sad thing is the incumbent office holders oftentimes scheme to try and keep something off the ballot and do whatever the necessary, in some cases, to do that. And what we are doing in our case right now is we want to set a precedent, a legal precedent that the constitution of Illinois means what it says, that people have a fundamental right to put a binding referendum on the ballot to have term limits on their local officials. Philip Blumel: Right. Well, I hope you’re going to win this. And it sounds like you have legs to stand on here. In intervention from the authorities at some level, did stymie you back in 1994 with your Eight is Enough effort to put term limits on the state legislature. I understand back then, as you said, you collected about half million signatures, again for an eight year term limit. What was the mechanics behind that? I mean, it was a different question. That wasn’t the rule of three that was issued then, it was the Supreme Court of Illinois said that it was not proper. What was their complaint about your referendum? Governor Quinn: Well, Illinois does not have full fledged initiative like the state of Missouri or Ohio or Michigan. In the Midwest here, we have a very limited initiative at the statewide level enacted in 1970. And it said you can have an initiative if it deals with the structure and procedure of the Illinois Legislature itself. Kind of limited and kind of murky to be honest. And we had used this provision to reduce the size of the legislature with the Cutback Amendment that was deemed by the court to be within the bounds of structure and procedure. So in 1994, we went out and gathered all those signatures statewide to put a eight year term limit on state legislators. And after gathering the signatures, the other side organized a big effort to keep it off the ballot, and it went to the Supreme Court and the court in a very close case, four to three, seven judges would … only three voted our way, unfortunately. Governor Quinn: And this wasn’t a term limits isn’t structure and procedure. I think it was a wrong decision, but unfortunately we didn’t prevail, and the voters didn’t get a chance to vote on term limits for legislators. And it’s very sad because we’ve had a Speaker of the House in Illinois who’s been in office, the same legislative office, since maybe, I think about 1970, they get set in their ways, and too many things happen that don’t open up government to the kind of innovation, and new ideas and reform that the public wants, and it really is where I’m coming from when it comes to government. I think we need to strengthen voters, give voters more power. Too often the incumbent office holders think it’s all about them and try and use their power to maintain their power. And this is an American story that never ends. It’s important to always look for ways to strengthen the power of everyday people, band together for causes they believe in, and then put them on the ballot and hopefully vote him into the constitution or the law. Stacey Selleck: Chicago voters are fed up with corrupt career politicians. Chicago is getting a new mayor, the election is February 26th. That’s right. In a stunning September 18th announcement, Rahm Emanuel said he would not seek a third term as mayor of arguably the nation’s most corrupt and fiscally unsound city, in one of the most corrupt states. Technically he didn’t have to step down, as Chicago is the only top 10 city in the Union without term limits. Emanuel’s predecessor, Richard M. Daley, served 22 years as mayor, and his father, Richard J. Daley, held the position for more than 20 years. “This has been the job of a lifetime” Emmanuel stated, “but it’s not a job for a lifetime” citing personal reasons for the decision. Hmm. Think he’s a term limits proponent? AARP just released the results of a new poll indicating that 69% of the voters surveyed placed more importance on a candidate with expertise over a seasoned politician with ties to existing leaders in the city of Chicago. Stacey Selleck: What that says to us is that 69% of the voters wanted elected officials with real world experience and not career politicians whose only experiences being a politician. The very real problem Chicagoans indicates they face are economic pressures, political corruption and crime. Cleaning up Chicago politics will help resolve the latter two issues and will go a long way to fixing the first. The devolution of quality of life in Chicago is not being resolved by career politicians with tons of institutional knowledge. Nearly half of the 50 Aldermen have more than eight years on the city council, the longest serving member, Ed Burke, who holds the record at nearly 50 years, is currently under FBI investigation for extortion. You can read more about his escapades at termlimits.com, and we’ve also reported this story in earlier episodes of this podcast. Rest assured, we’ll be keeping a close eye on this election. Philip Blumel: Yeah, I think it’ll have a big effect in Illinois as you say. But also I think nationally, I mean Chicago is not just the biggest city in Illinois, it’s one of the biggest cities in the country. And nine of the 10 largest cities in the United States have term limits on their mayors, and Chicago’s the exception there. I think that’s a big deal, not just for Illinois, but nationally. Philip Blumel: Mm-hmm (affirmative). I find it fascinating you mentioned diversity, that you are a former Democratic governor of this state and then you were followed by Governor Rahm, who’s Republican, who basically tried to copy what you did with the referendum on eight year term limits on the legislature. The fact that both of you pushed this issue, what does that tell you about term limits as a political issue? Governor Quinn: Well, I really don’t think it’s ideological Democrat, Republican or Conservative Liberal. I think it really goes back to the founding of our country. The founding fathers didn’t call it term limits. The term back then was Rotation of Office. I think the people who started our country, our democracy, very suspicious of concentrated power in one person. We had just told King George to take a hike, he’d been on the throne there in England for 59 years, and we didn’t want a House of Lords here. We didn’t want a monarch. And I think George Washington set a very good example for all office holders. He had two, four year elected terms, and then he went home. He decided to step aside and make … he could’ve been monarch for life. I think everybody knows that, but he knew that if he ran again for president, it would become too much like a monarchy, and Washington was wise, and he stepped aside. And too many of our modern politicians, I don’t think have followed that example. Governor Quinn: They need to, I think get an infusion of a history and understand that American democracy works best if you get elected, and you’re lucky enough and privileged enough to be in office, that you do the best you can, but it’s not there forever. You’ve got to serve your time and do the best you can, and then a step aside, you could run for another office if you want, but the idea of being in the same office for years and decades at a time is not healthy. Philip Blumel: Okay. Well, one last question. It looks like we’re going to get term limits for the mayor of Chicago, and that’s wonderful. Are we someday going to see term limit’s on the Illinois legislature? Governor Quinn: Well, that is a big mountain to climb. Probably Mount Everest in this state. I do think we will prevail. You know, I had to work, I guess it was like 31 years, maybe longer. Yeah, at least 31 years to get recall established in Illinois. I proposed it, I think in 1979. We finally got it on the ballot in 2010, and passed it. So I do believe in never giving up. Sometimes you don’t win them all, all at once. But it’s important to always understand that the power of our country is really everyday people banding together for the causes they believe in, including term limits, and using petition and referendum is the best way for everyday people to get their voice heard. I said earlier, the initiative and referendum process is the fourth branch of government. You know, we’ve got the Executive, we got the Legislature, we got the judges and all that. But a stronger initiative power across America will make our country better, our states better and our cities and communities better. Philip Blumel: So true. Thank you very much for your time and also for your efforts. And thanks again, Governor Quinn. Governor Quinn: All right. Thank you, Phil. Philip Blumel: Which state will pass the Term Limits Convention Bill first in 2019? It looks like Arizona is in the lead right now, but victory is not inevitable in Arizona or any other state. One bad committee vote and we’re sunk for another year. If you signed our online petition, and you live in a target state, please keep your eyes peeled for our action alerts. When you get one, please take the requested action immediately. Philip Blumel: Also, if you’re listening to this podcast via website or maybe some other source, please subscribe to No Uncertain Terms. You can do this on your iPhone using the podcast app that comes with the phone, or if you’re using an android device, you can use Stitcher or Google Play, or go straight to iTunes. Subscribe there and rate and review us. We’ll be back next week with more news from the front lines of the Term Limit Revolution. Stacey Selleck: Mark your calendars ’cause February 27th is National Term Limits Day, and it’s less than a month away. Stacey Selleck: Hi, this is Stacey and I have some exciting news for you. We relaunched our US Term Limits online store with updated merchandise, so you can get your term limits swag on before National Term Limits Day on February 27th. And as a special offer for a limited time only, you’ll get 10% off everything in the store if you purchase before February 15th. We have tee shirts, bumper stickers, coffee mugs, baseball caps, banners and more. So check out our store at termlimits.com/shop. You get 10% off everything if you place your order before February 15th.